Have your own crocheted Link as a finger puppet, sitting safe and sound on your dresser, or hanging on your back pack! 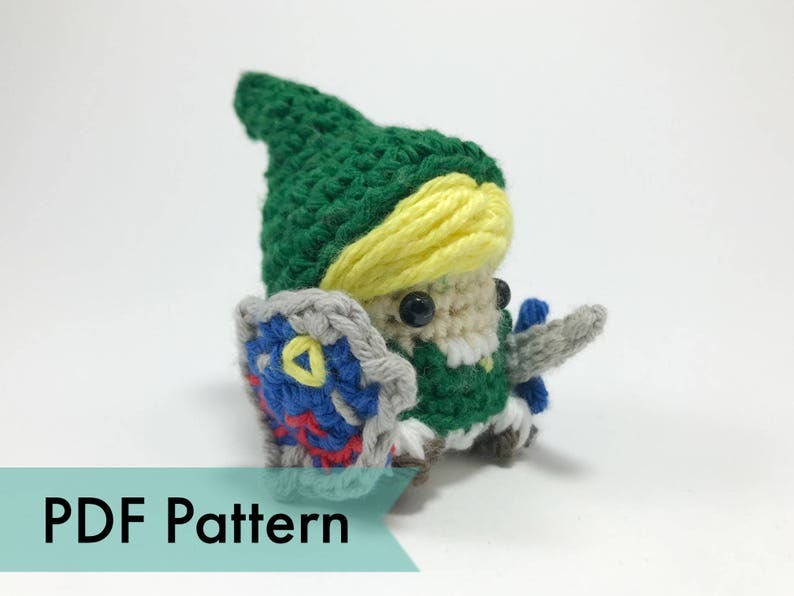 This little Link from The Legend of Zelda miniature amigurumi measures about 2 inches tall when finished and includes 5 unique video tutorials to help you get through the tough parts! Love these patterns and all the options for customization and accessories. Perfect for making mini figurines for D&D! Pattern was super easy to read and follow. The video was really helpful when I needed clarification and a clear example. Adorable dino! Gosh darn it I love this pattern! For any physical orders that I have crocheted (other than custom made to order items), I am happy to issue a refund as long as the item is still in the condition when shipped or you catch me before hand! For patterns, if the pattern has not yet been shipped, then of course a refund can be issued, other wise, message/email me and I'd be happy to work something out. Message me here or email me at Louies.Loops@gmail.com if you have any questions! I absolutely take custom orders if you want something made.